The powerful vocalist Bishop Briggs has gained notability as fans await the release of her album “Church or Scars,” due out April 20. Pre-order the album on bishopbriggs.com/. Through Briggs’ emotionally charged lyrics and her beautiful vocals she leads every track bringing a sense of intimate emotions to each song. 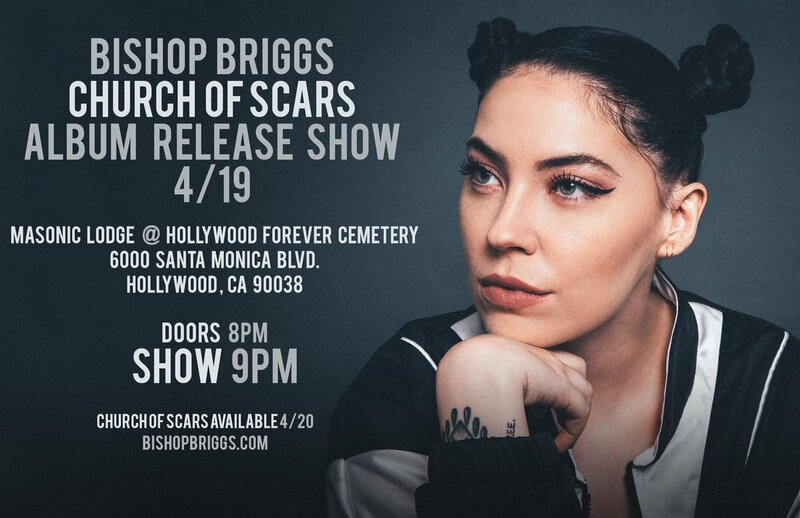 Songs like “Dream,” “River” and “White Flag” have kept fans excited for the release of “Church of Scars,” which will have a special album release show at the Hollywood Forever Cemetery on April 19, before fans can find Briggs out at Fingerprints Long Beach on April 20 and Amoeba Hollywood on April 25. The experience of Briggs’ music is only intensified when getting the opportunity of watching a live performance. The LA Native is showing her appreciation for LA with several events before heading out on the road and returning for a show at the Fonda Theatre on May 4. With so many artists gaining popularity, the unique feature of Briggs is the raw powerful emotions which listeners can connect to. Briggs’ a vocal powerhouse whose lyrics can hit deep into the soul of listeners. Best known for her song “River,” all it takes is listening to one track for people unfamiliar with Briggs to have their interest peaked. Whether listening to Briggs’ on headphones or singing along while blasting her music, the energy and sensation of Briggs’ music is undeniable. Fans can keep up with Briggs on social media, where she’s actively giving a glimpse of her daily life.